Through my company, SkillsCamp, I often teach people about personal branding and other life skills. The following is a short, personal, and true story I share about the tangible power of a well-crafted personal brand. Growing up in Canada and wanting to work in broad journalism, CBC was at one point my dream place to work. So, you can imagine my excitement when I received the following email late on a Wednesday night in December 2014. A project manager at CBC Sports reached out (what seemed at the time to be out of the blue) and asked if I wanted to join a social media think tank focused on engaging the ‘under 24’ demographic. The actual email is below. Of course, I accepted and joined the think tank, where I ended up meeting the person who would later hire me at CBC. The think tank met a couple times, and when it was done, I was slightly disappointed — I was really enjoying meeting up with smart people and talking about things I find incredibly interesting. This was until I received another email from CBC Sports a few months later asking if I was interested in a role as an Associate Producer for a campaign about the volunteers during the Pan Am Games. Again I accepted and this ended up being one of the most fun jobs I’ve ever had. You can check out my full experience here. 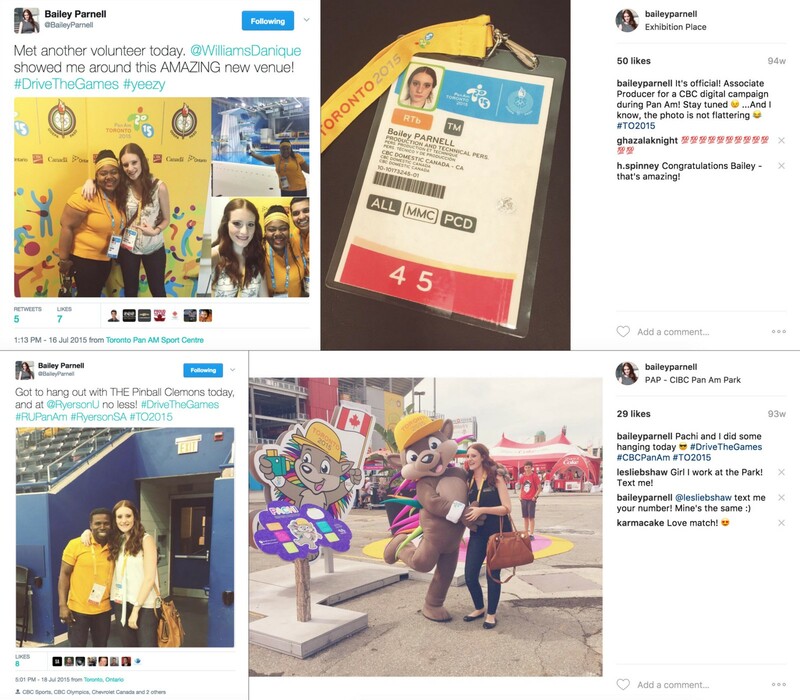 A few of my posts from my time with CBC at the 2015 Pan Am Games. So How Does Twitter Come Into This? Well, you may have noticed at the beginning of that initial email CBC sent me, they said someone had forwarded my contact information to them. That person was an amazing professor I had in my very first semester of my first year in the RTA School of Media at Ryerson University. She taught my audio class. I never had her as a prof again though I very much would have liked to. However, beyond the occasional pass in the hallways, this prof and I remained connected primarily in one place: Twitter. As it turned out, over the years, I had been sharing many stories about my work in social marketing, my public speaking, my gigs in media, and my work with students (the 18–24 year old demographic). All this led up to a moment I had no control over: when this prof’s personal friend at CBC asked her if she knew anyone she thought would be good for this think tank. Unbeknown to me, she forwarded her friend my email, and here we are. When I teach personal branding, I tell my students I couldn’t write this story better for why a personal brand is important. Personal branding is really just the intentional telling of your story. Telling that story is critical to making you stand out in a sea of [insert job title you want]. People (head hunters, future clients, potential collaborators, etc.) are looking for you even when you’re not looking for them. I have many more stories just like this one. It is important to be consistent and maintain your personal brand so that when someone thinks, “whom do I know that could speak about social media, young people, and CBC” your name comes to their mind. Your personal brand does not just live online. If I had not provided value during the in-person think tank meetings, they wouldn’t have thought of me again for the next opportunity. Do you have any stories about your social media or personal brand landing you a job? I’d love to hear about it! Tweet me the details: @BaileyParnell. How to bravely define what you stand for in your career, small business, and life. Curated by @JosephPLiu, host of the @CareerRelaunch podcast.